Woohoo, we made it to Friday!! So happy the weekend is here! Any big plans for the weekend? However, I don’t want to hear plans from the people on the East Coast who are saying it’s in the 70, 80’s & 90’s, that is so not fair!! I don’t want to know about wearing t-shirts and shorts, enjoying sunshine and planting in the garden. I am stuck in California where it is rainy, windy and COLD! Only 51 is the high this weekend. I remember living in Buffalo and my Mom lived in CA and she would call to say it’s so warm out and I am sitting there in my long johns with the heat cranked up freezing to death and I thought one day I’m going to move to CA. Than I finally do and what happens? The East Coast gets all the warmth. I’m telling you it must be me. So my East Coast friends, you should be thanking me. 🙂 To show your appreciation, just send presents! Well I did manage to get two semi-warm days here so I cranked up the grill and made some burgers and I also made Grilled Potato Chips. I haven’t made these chips since last summer and I forgot how much I miss them! 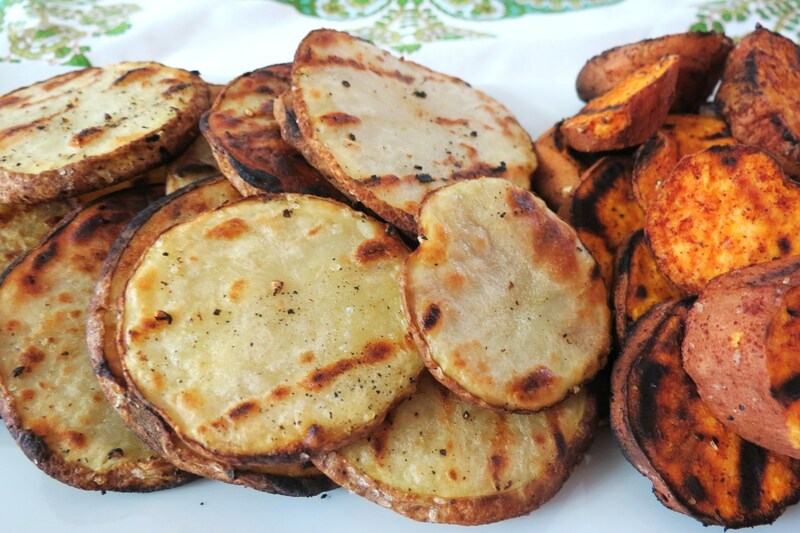 I used one Rustic Potato for Hubby and two Sweet Potato’s for me. You’ll notice, if you haven’t already, my Husband does not like sweet potatoes, so whenever I make a potato dish I make sure I use half white and half orange. That way we both get what we want. These chips are crispy on the outside and soft and warm on the inside. There really the perfect potato chip! They are a great replacement for french fries and cook way quicker! They cooked faster than my hamburger. My Husband actually asked me where did I get them from, hello Sweet Pea, I made them. I think when I make something he likes, he thinks I buy it? The prep for the chips is really quick too. All you do is slice the potatoes, add some olive oil, seasoning and place on a grill sprayed with cooking spray. The key thing to making these, is watching them. You can sneeze and they’ll burn. They cook about 3 – 5 minutes per side depending on how thick you cut them. Oh and they taste best served warm, so make these last with whatever your serving. However, I will eat them cold, but warm is better. One thing I should tell you about me, is that I cook everything on the grill. I sub the grill for my oven all the time. I even cooked a pot of fruit for making my fruit bars on the grill. It was nice out and I figured why not? I’m a little grill crazy!! Maybe a little crazy period? No comments please! 8 oz sweet potato, scrubbed clean, sliced about ¼"
8oz rustic potato, scrubbed clean, sliced about ¼"
In a large bowl add potatoes, olive oil and toss until covered. Add seasonings and toss again. Spray grill with cooking spray and set the heat between low and medium. Place potatoes on grill, close lid to grill and cook for about 2 minutes, check them, if there starting to brown, flip them over. Cook until other side is lightly brown and center of the potatoes are soft, about 2 - 5 minutes. Note: The key thing is watching them, don't leave the grill. Tonight was tax night, ugh! So I didn’t get home till late and oddly enough it is my bedtime. I hope you have a wonderful Friday and East Coast friends, you know I’m only joking! I would love to hear about your weekend, especially if it is nice out, that way I can live vicariously through you. Enjoy! Oh, you know I can’t go with out bugging you! As you know I was nominated for Best Healthy Eating Blog from Fitness Magazine and I would love if you voted for Peanut Butter and Peppers, but only if you like my blog. Your votes are appreciated!!!! To vote for PB&P, just go here. well, if it makes you feel any better, even with all this warm weather, I don’t own a grill, so I can’t really appreciate it fully. 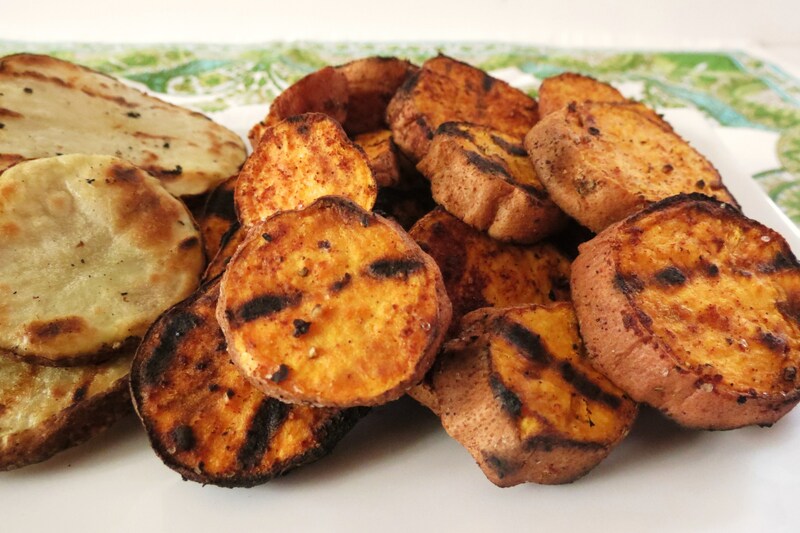 I really want grilled sweet potato “chips” now! Arrgh. lol, thats what you get for having such nice weather! 🙂 Enjoy your weekend, now send me some PB cupcakes!!! I’ve got so much to do this weekend! Ahh. A Barbie birthday cake to make, my god-daughters birthday on sunday, gym time to squeeze in and post to write! 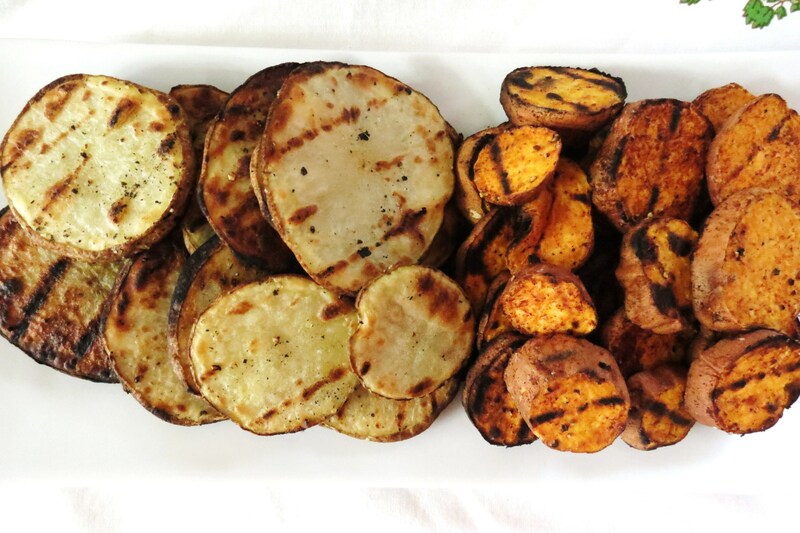 I love the idea of grilling these chips! I’ll have to remember that! Wow, your going to be busy! Glad to know I have nothing on my agenda except some baking! 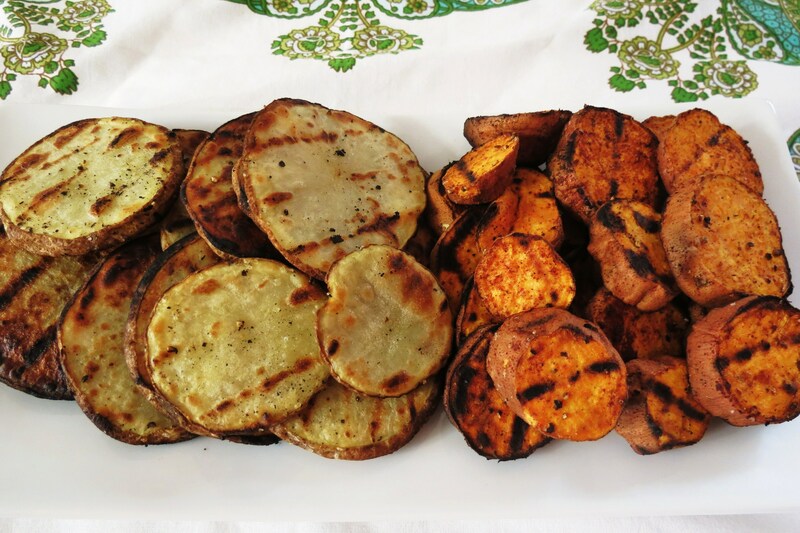 What a fun idea to grill your own potato chips! I baked some thinly sliced potatoes with the point of making potato chips rather unsuccessfully last week, but I think this is the way to go. Thanks for sharing, Jennifer!. Also, I’m having a great giveaway today with four potential prize winners, so you should enter! I tried making potato chips and I even bought the pan and I still can’t do it right, the grill is easier and quicker! I’ll stop by your site and checkout your giveaway! 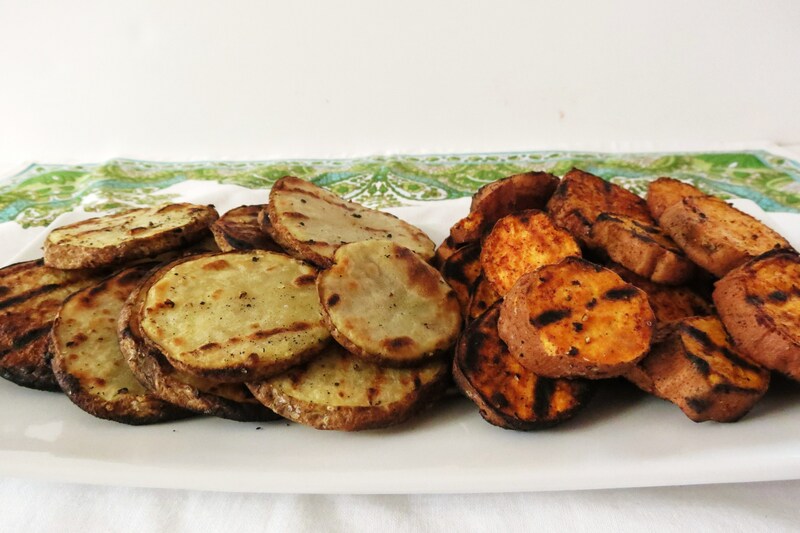 OMG why haven’t I thought about grilling up some potato chips! Ingenius, especially for me who is currently going through potato slump for my meat-and-potatoes hubby. Have a great weekend and go fire up that grill!! Your so lucky! It’s nice out now, but it’s not going to stick around!! Enjoy your weekend!! These are fantastic! 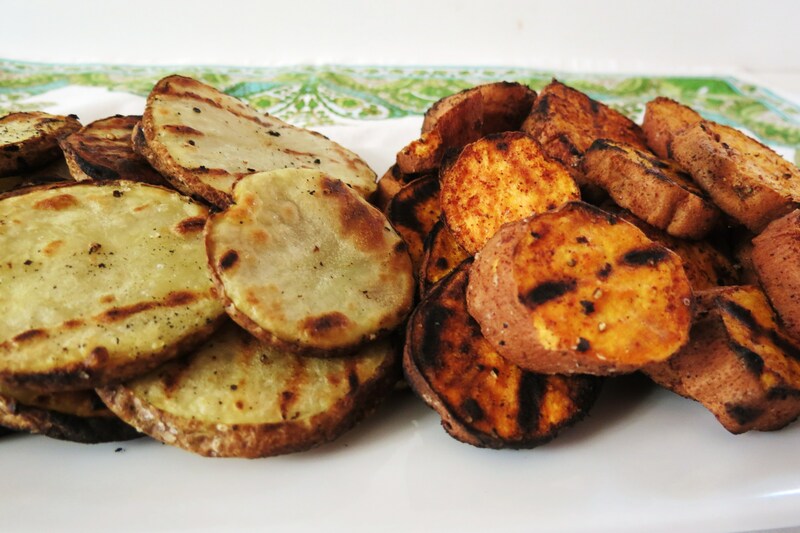 I’m crazy about grilling and I pretty much like grilled….anything! YUM! Isn’t funny how grilling tastes so good? I grill just about everything!!! I rarely turn my oven on in the summer! Wow – that’s such a cool idea! Are they nice and crisp? This goes on my to do list! There crisp on the outside and a little soft on the inside. It’s a mix between a potato chips and a french fries. Everything tastes better on the grill!! I’m going to have to try these out. Thanks for sharing. Hello! Just checking in from FoodBuzz. I love anything potato, but I have not tried them on the grill. Sounds yummy and I will try these soon! Thanks for sharing. Please feel free to stop by my blog and say hello. have an electric table top grill how can i make these turn out like yours with no lid on grill ? these look soooooooo delicious.